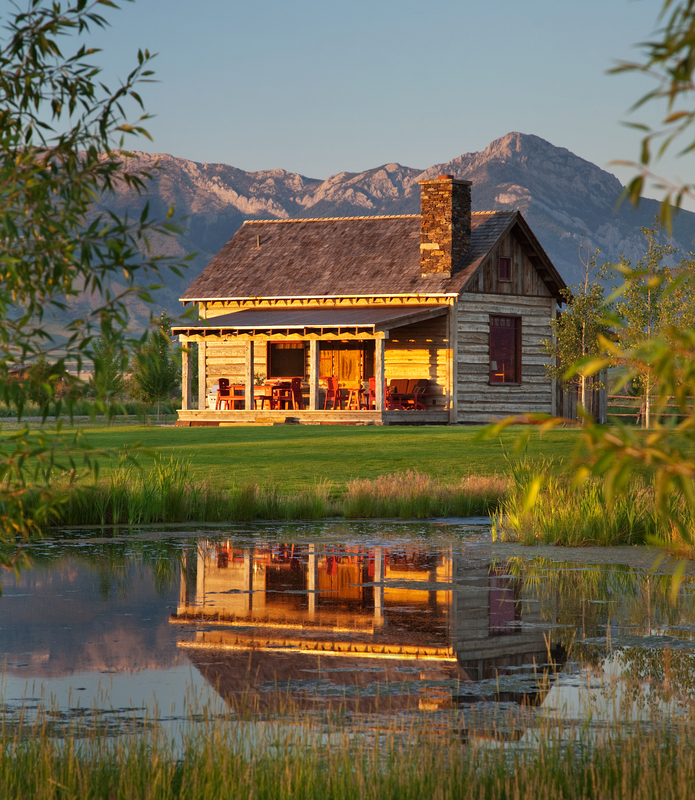 Set on just over 85 acres north of Bozeman, along a small stretch of the East Gallatin’s prosperous brush-covered waterways, avid fisherman Mark Kehke and his family have created a fly-fishing and upland bird-hunting paradise. One they lovingly call the East Gallatin Preserve. With unbroken views of the Bridger Mountains to the east and a secluded portion of the river to the west, the Kehkes’ set about to build first a small cabin, fishing ponds and garage — to house a restored, fire-engine red Chevy Apache pickup — before settling in to build their vacation home. “In the long term we intended the cabin to be a guest house,” said Kehke. The California-based family went so far as to delineate the four corners of their main house with large stones but have yet to break ground. The 1300-square-foot cabin, with its deceivingly tiny footprint, rustic wrappings and expansive 14-foot porch overlooking their private stocked trout ponds and nearly a mile of the fertile East Gallatin beyond, has thus far met, and in many ways surpassed, the family’s current needs and expectations. 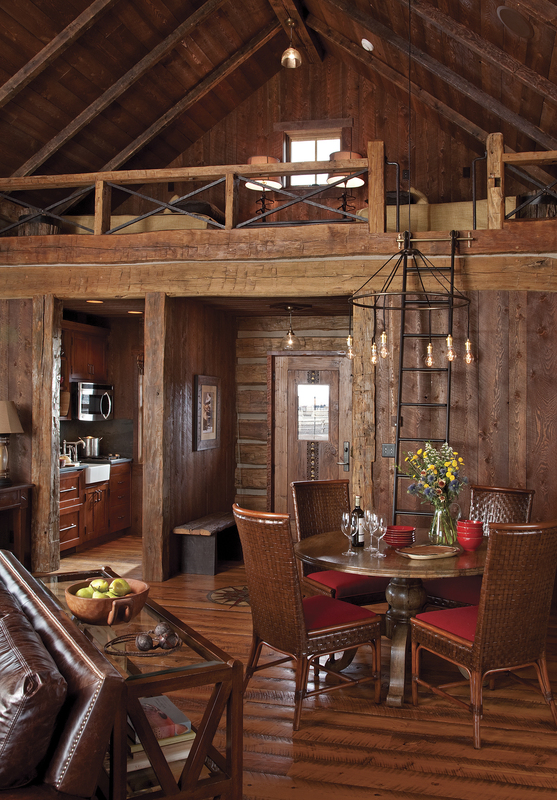 “We built the cabin in 2007,” said Kehke, choosing Yellowstone Traditions to complete their vision. “They started the cabin on November 15th and delivered it six months later on May 31st. Delivering it to me on time, on budget and with a level of quality and finish better than I’d ever hoped for,” marveled Kehke, a home and land builder himself. Yellowstone Traditions has a long history of preserving and restoring historic western structures. In this case, however, they built a brand new building using recycled and reclaimed materials. 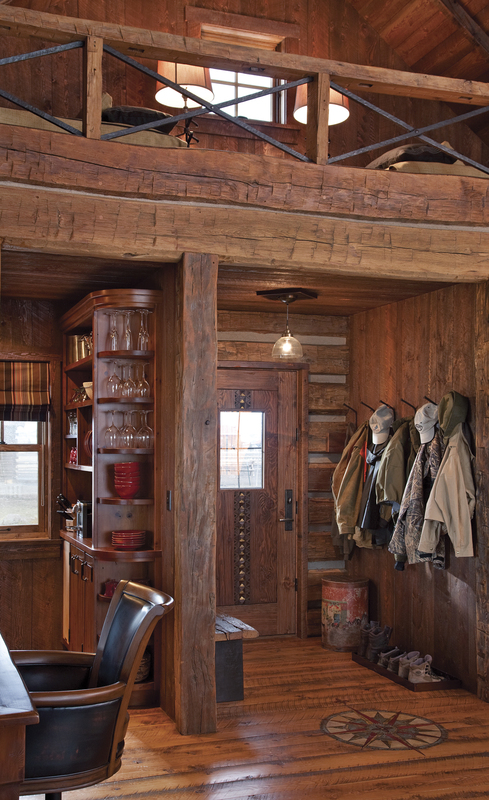 While the East Gallatin Preserve cabin appears as a traditional log stacked structure, it’s framed with 2×6 walls, insulated with premium urethane foam insulation and heated with in-floor hot water radiant heat fired by a high-efficiency propane boiler. “The design of the East Gallatin Preserve was a successful collaboration,” said Tim Blazina, Yellowstone Traditions project manager. Kehke brought in his friend and business associate, John Sather of Swaback Partners for siting and architecture, family friend Marni Duncan of Model Home was the source for furnishings and worked with Yellowstone Traditions on custom cabinet design and material selection. “Mark had a strong aesthetic sense for the building that required it to be functional without wasted space,” added Blazina. The disarming, rustic exterior, clad in antique hand-hewn slabs, gives way to a warm and inviting modern interior. Natural, unrefined elements mix comfortably with classic contemporary furnishings that give more than a nod to the cabin’s western roots. 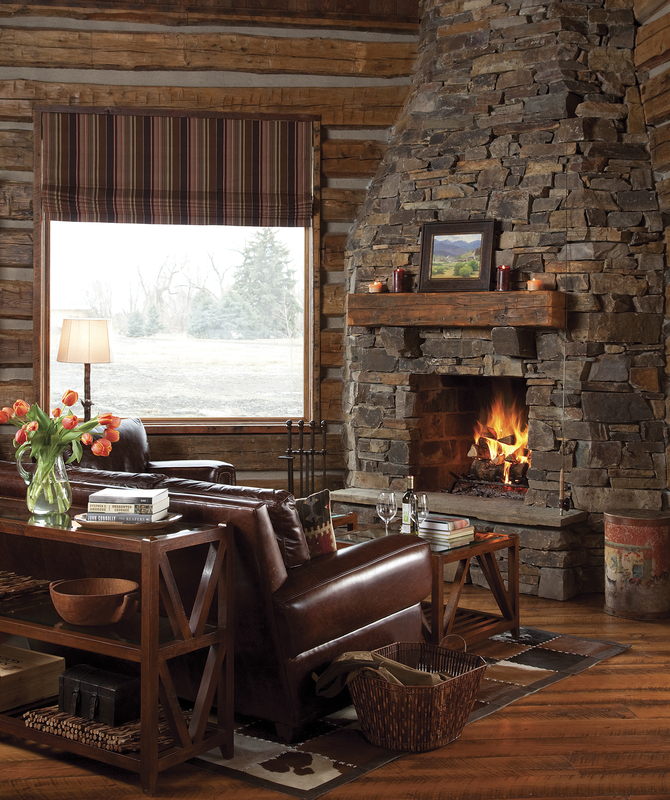 Warm wood tones and shades of tawny brown envelop the living room. Both ceiling and floor are clad in planks made of rough sawn fir, crafted so well the new materials appear to have come from recycled wood stock. The cabin’s exterior log-stacked façade appears seamless as one enters the main living space. Upon opening the custom front door — crafted by Yellowstone Traditions’ artisans and detailed by Missoula-based painter, Jennifer Bessen — a great stone fireplace placed strategically in the southwestern corner beckons invitingly. With its curious curvilinear shape tapering high into the vaulted ceiling, it makes for a dramatic and functional centerpiece with the instant feeling of home. A quiver of Winston fly rods nest silently against Chief Joseph stone — one of the many utilitarian accouterments cast about the cabin. Much like the fishing journals, wading gear, binoculars and bright orange hunting gear, they serve as mindful cues for both the Kehkes’ family passion and the cabin’s purpose. At first blush, the small galley kitchen tucked in the northwest corner seems like an afterthought. Though extremely well-appointed with custom Yellowstone Traditions cabinetry crafted from recycled fir, honed slate countertops and backsplash, a Wolf two-burner gas stove and Villeroy & Boch farmhouse sink, this tiny marvel is only 36 feet in size. For the Kehke family, cooking, like most of their time in Montana, is spent on their porch outside. “The kitchen really is more of a prep kitchen; we do most of our cooking on the barbecue,” said Mark. The cabin’s timeless, relaxed style flows through to the master suite. Here, vertical panels of rough-sawn fir were first painted linen white, then sanded to provide texture and a beautiful distressed finish. 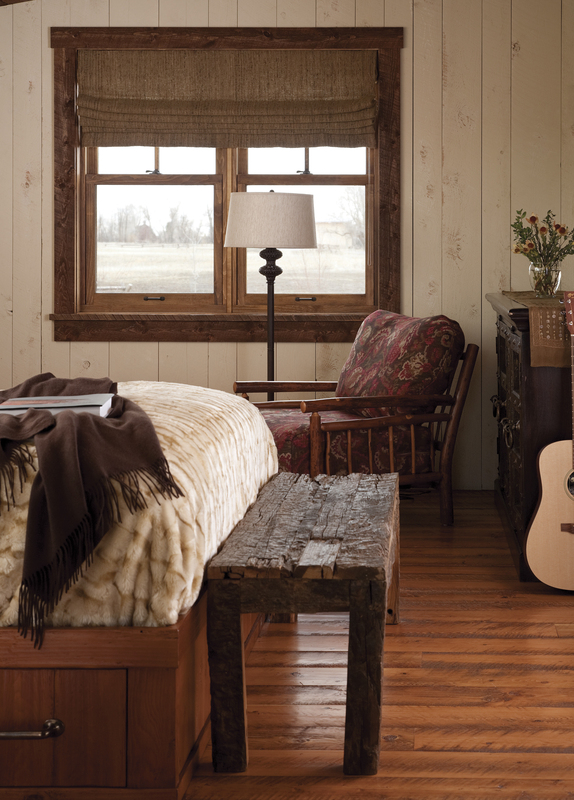 Yellowstone Traditions’ custom king bed frame provides storage underneath, while its low-slung headboard appears to seamlessly drift into the trio of windows above. In the master bathroom, a small stream design cut into the tumbled travertine floor leads to the walkthrough shower, which provides the opportunity to shower either inside or out. Outside, large slabs of Harlowton stone create steps to the enclosed shower space touting Bridger views. With its close proximity to the ponds and river, it’s a convenient spot to clean off after another day of fishing. Though the family still plans on turning those four large piles of rock into a home, the East Gallatin Preserve cabin is where they’ll hang their fly rods for now.